Striata’s innovative electronic messaging solutions help create new marketing opportunities to reach customers who use online payment portals and self service kiosks to pay their bills. These bill payment websites have become an expected fixture in the banking and mortgage industries, and play a vital role in their overall strategy to reduce costs – especially those expenses associated with paper statements and billing. 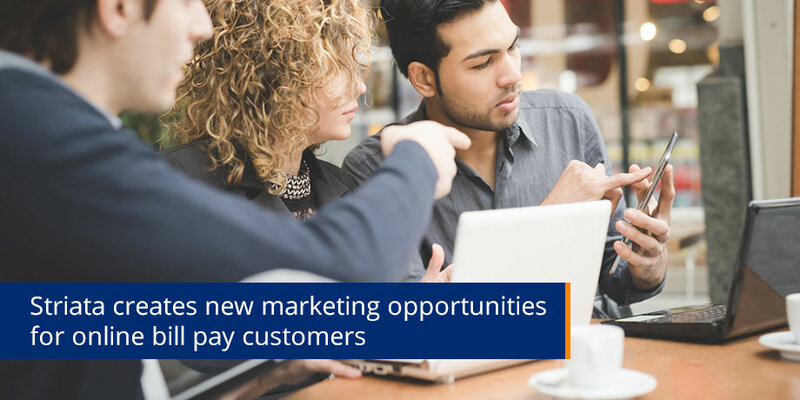 While a successful online payment portal can help facilitate paper turn off and reduce associated billing costs, it can also mean losing out on a one-to-one marketing opportunity. Traditionally, customers receive bill inserts or “stuffers” incorporating marketing offers in the same envelope as their paper bills and statements. In most cases this marketing opportunity is lost when a customer opts to view and pay their bill online. For the financial services industry, where a significant amount of revenue is generated from customer retention programs, this can add up to a sizeable loss. This is where Striata adds significant value. Our innovative messaging solutions can be used to replace this lost marketing opportunity with personalized email marketing offers that are considerably cheaper and more effective than paper bill stuffers. Striata’s technology addresses the marketing challenges of online bill payment portals by turning simple, plain text payment confirmation emails into a revenue generating marketing channel. While there are even more “touch points” to a Striata type push eBilling process, the ability to customize an existing payment confirmation email can be implemented in a matter of weeks, and offers a unique opportunity to market to customers who pay online. The same functionality that Striata uses to “push” an encrypted eBill to a customer’s inbox can be used to “push” a rich payment confirmation email to the customer. Unlike banners and buttons on a website, a payment confirmation email can be customized to include relevant, targeted, personalized marketing offers. All commercial emails can (and should) be personalized according to customer demographics or other business drivers and marketing criteria. Striata’s advanced profiling engine enables clients to include pertinent offers based on demographic, psychographic and usage information, such as current product and service usage, length of service and billing address as well as age, gender, income bracket, purchase activity and customer enquiry behavior. In addition to eBilling and Secure eDocument Delivery solutions, Striata provides payment confirmation marketing and agency quality eMarketing services to some of the largest financial services companies in the world. For example, we helped a mortgage company to effectively market its customer retention programs to customers who pay online. The challenge for the company and its subsidiaries was that customers who went “paperless” were difficult to reach with their highly profiled marketing initiatives. Striata implemented a sophisticated and customized messaging solution that collates customer payment confirmation data with profiling information, to generate tailored marketing offers. Before incorporating Striata’s solutions, the mortgage company was sending out plain text payment confirmation emails which simply provided a unique confirmation number each time a customer made a payment online. Each customer who pays their bill online receives an HTML payment confirmation email with three personalized offers as well as helpful hints for effective mortgage or loan management. Each email also includes the name and contact information of the customer’s loan officer – a subtle encouragement for customers to engage their loan officers directly. In many cases, this has resulted in customer queries, previously channeled through the call center, being directed to the customer’s personal loan officer. Not only does this reduce the cost-to-serve in the contact center, but it also re-engages the loan officer, providing them with additional opportunities to up-sell to their customers. Marketing within the payment confirmation email is considered a ‘best practice’ electronic marketing opportunity because it is directed at recipients who are expecting to receive the email: customers paying online certainly want confirmation that their payment was successful. This is one of the most effective types of marketing that money can buy, because you are marketing to an expressly interested target audience – yet email marketing costs a mere fraction of paper bill stuffers. And unlike paper based offers, billers can accurately track which offers were clicked on, when, how many times, and by which customers. This type of detailed click tracking and reporting facilitates intelligent, revenue-based marketing decisions because it’s derived from measurable customer behavior. Marketing via the payment confirmation email is just as effective in other industries such as insurance, cable, and telecommunications, not just banks and lending services. It happens to be especially appropriate for financial services, as more and more of their business is now web based.